Alex was an intense little boy. From a very young age, he was fascinated with steam engines. Most of his play and conversations revolved around trains. In the school yard, Alex generally wandered around alone. He was not interested in sport, and had difficulty understanding the ever-changing playground dynamics. Unless he joined in the football games, Alex felt he was destined to be alone. 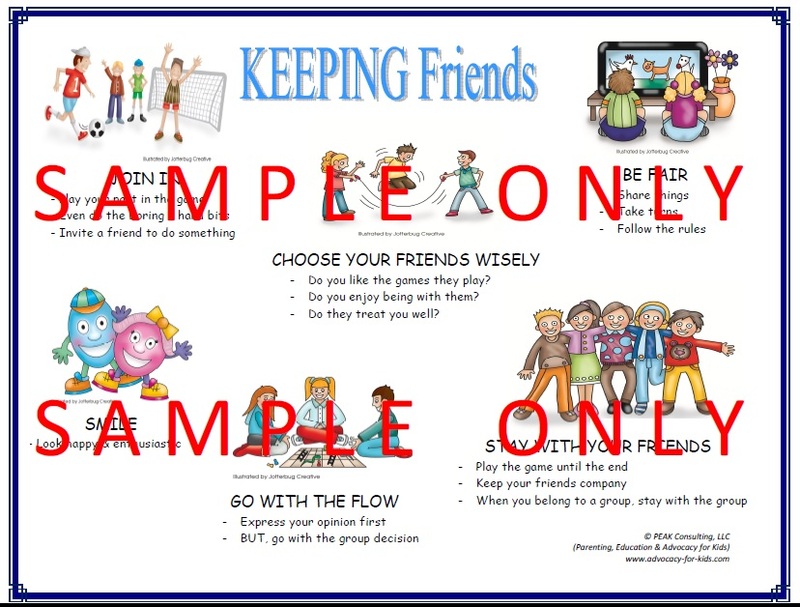 Through this pictorial poster, we were able to address a range of ways in which Alex could interact with others and develop friendships. MOTIVATIONAL POSTER - "Making Friends"
Sasha found it very easy to make friends. She was enthusiastic and always willing to join in games. Lunch times at school, however, were difficult for Sasha, as she had trouble actually keeping the friends she made. Sasha liked to play by her rules only, and was often left with a great game, but no friends. She was also impatient and intolerant of others and would walk away in the middle of an activity if things were not pleasing her. The idea of actually working on friendships took her by surprise. With some helpful prompts and suggestions, she began to understand the importance of building, valuing and maintaining friendships.